Camera/Camcorder is no more a luxury item, but rather a necessity. No matter whether it’s your birthday, an outdoor picnic, graduation party, marriage, or just a casual getting together, recording them in form of videos not only captures them forever but creates memories for a lifetime. The technological advancements have gifted us with high-end recording camera and camcorders that are capable of recording high-quality videos. On the flip side, these HD quality videos occupy a lot of space and thus fill up camcorder memory card very fast. Transferring these videos to PC can be one of the solutions, but not full proof as PC memory is already packed with lots of other important information and data. Thus one of the best solutions to free up space on your camera and camcorder without deleting your favorite videos is to burn camcorder to DVD. Burning videos to DVD will not only save space on camera or PC, but will also make your videos safe and secure for the lifetime. Moreover, burned DVDs are easy to carry and play, no matter wherever you may go. Moreover, DVD with videos of your special moments can be gifted to your loved ones. So if you are also looking for ways to convert camcorder to DVD, and clueless about the solutions, read below to know the best ways. Part 1. How to Burn Camcorder to DVD on Your Computer Easily? Though there are different ways and solutions to burn videos of the camera to DVD, using professional software like Wondershare UniConverter (originally Wondershare Video Converter Ultimate), will not only make the task simple but also quick. This wonderful software is a complete tool for all your videos related needs. The software allows to directly convert camcorder to DVD at a high speed without any quality loss. Additionally, the software also helps to convert any format to DVD, provide free templates, and facilitates editing DVD files using the built-in editor. So no matter whether you have Sony, Canon, GoPro, Panasonic or any other camcorder, connect using Wondershare video converter Ultimate and burn videos to DVD. In addition to burning DVD, other features of the software include converting videos to an array of formats, editing videos, downloading videos, transferring videos, fixing metadata, screen recording, and others. The software is available for both Windows and Mac devices. Step 1 Run Wondershare UniConverter (originally Wondershare Video Converter Ultimate) and load camcorder video. 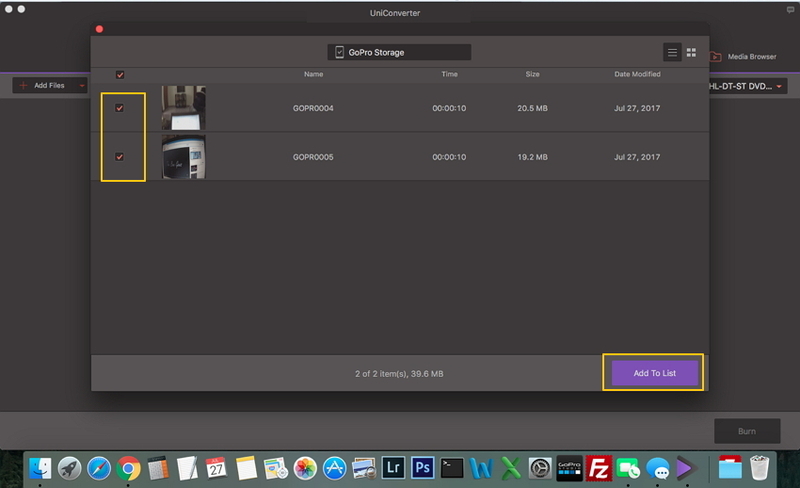 Run Wondershare UniConverter (originally Wondershare Video Converter Ultimate) software on your Mac. Connect your camcorder to your Mac using a USB cable. On the main interface of the software select Burn tab. Click the icon of drop down beside Add files and select Add from Camcorder from the drop-down list. A new pop-up window will appear with a list of all the videos present on your camcorder. Select the videos that you wish to burn and click Add To List. Step 2 Edit camcorder videos (optional). If you want you can edit the videos added from the camcorder using the software. 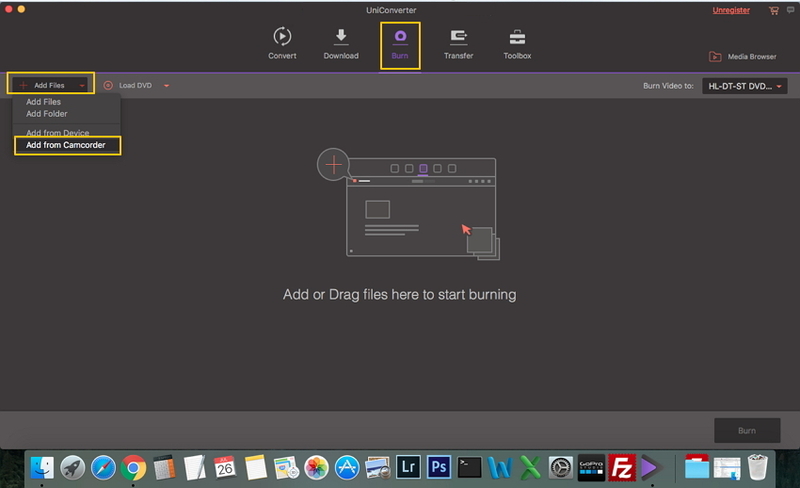 You can trim video, crop video, apply an effect, add watermark, or add a subtitle. There will be three editing icons present for trimming, croping and effect under the thumbnail of the selected video. You can select and perform the desired action. Note: This step is optional and in case if you do not need any editing, you can skip this step and directly move to the next. Step 3 Burn camcorder videos to DVD. Firstly, to burn video, select the desired DVD template by moving right and left arrows. You can even adjust the needed DVD settings with respect to DVD label, menu type, aspect ratio, TV standard, and quality. Finally, select the destination folder where you want to burn the video to at Burn Video to section. Click Burn button to start the process. It's very easy to do it, right? Q1. What is the difference between a Camera and a camcorder? ANS: Present day high-end camera comes loaded with features that allow capturing good quality images as well as videos and thus the line of difference between the two has become very thin. Still, there are a few features that make camcorder different from the camera. Video quality is the first difference between the two; camcorders definitely support a better quality of video recording as it is its forte. Secondly, lens of both the devices differ as camcorders generally have better and robust zoom enabled lens. The internal microphones used on camcorders are of better quality as compared to the camera. The ergonomics, video control and media options are some other areas which differentiate between the two. ANS: There are different types of camcorders available in the market and selecting the one that best suits your requirements is very important to get the best videos recorded. The type of recording, recording hours, the quality needed, and the handling are some of the features that will help you to decide upon the perfect device. If you are looking for a camcorder to record special occasion or a party, HD camcorder with automatic/manual modes (depending upon your ease of use), and good zoom option will be a good choice. For your vacations, you can settle for a little sturdy and compact device that is easy to handle on move. For your little teenager who is all set to explore his skills, pocket camcorders will prove to be a great choice. For recording sports and action events, a camera with high optical zoom must be preferred. Thus depending upon the purpose and features needed, you can decide upon a camera. Q3. What makes hard drive camcorders different from flash memory camcorders? ANS: Hard Drive camcorders are not very common these days. These types of camcorders have fast moving disks with magnetic surfaces in order to write and rewrite data. Presently flash memory camcorders are generally used as they allow the device size to be small and lightweight. These camcorders use microchips that have memory cells that are erased in one flash or action. These camcorders are fast when it comes to recording and accessing the media. Q4. What's the difference between digital zoom and optical zoom? ANS: The two most common words that you will encounter while dealing with camcorders is optical zoom, and digital zoom, out of which former holds more importance. The number of optical zoom refers to the ratio of the zoom lens in the camcorder while the digital zoom refers to the technique where image centre is enlarged and thus boost the zoom ratio of the device. Thus when referring to digital zoom, quality can be hampered with jerky videos. Optical zoom is thus more important for capturing quality videos. Q5. What is the best way of using the zoom lens in camcorders? ANS: Manual zooming is the best way as it not only saves time but also the power of your battery. Thus whenever possible, opt for manual zooming between the shots and then you can edit them from the final list. When you need to zoom on a particular subject, zoom it before you take the shot, then set and lock the focus, and finally zoom out to the start. Using this technique, your subject will remain in the focus through entire shot. 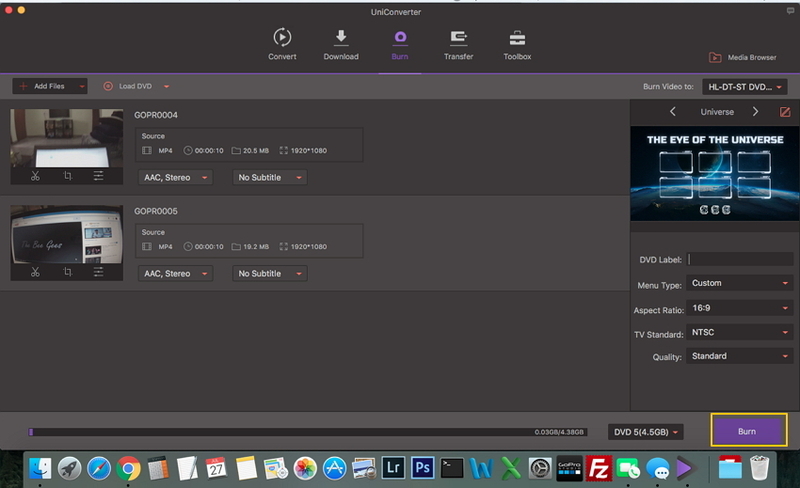 Anyway, using Wondershare UniConverter (originally Wondershare Video Converter Ultimate), you can easily and quickly burn your camera videos to DVD. 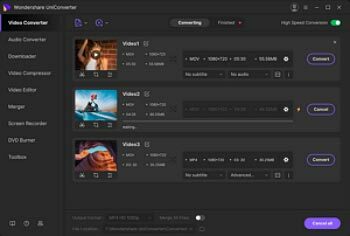 The professional software comes loaded with an array of additional features to meet most of your video needs. Have a free try now.